S. Howes became a 100% employee-owned company after it was acquired by Carrier Process Equipment Group, an international leader in the world of process equipment industries. 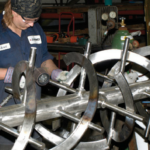 For over 160 years S. Howes has provided robust, proven equipment to the processing industries. The company uses modern manufacturing techniques to manufacture its engineer-to-order product lines with quality as a focus. S. Howes offers to its customers: mixers & blenders, screw conveyors, separators, size reducers, grain cleaners and pressure leaf filters for a wide variety of processing industries. For more information about S. Howes, please connect with them on LinkedIn, and on the web at www.showes.com.